Why do it? Just like writers, photographers and chefs, it is because of the challenge. Many of the greatest wine growers and winemakers aim their sights at the Holy Grail and pursue Pinot Noir with unrelenting faith because when Pinot Noir is great, there is nothing better. This is where the geekiest of wine folks live. It is an on-the-edge behavior that puts them in another realm. Two recent vintages in the Willamette Valley underscore this theme. 2011, which was a cool year, yielded many ungenerous wines that most “normal” wine drinkers may not enjoy. Yes, they may pretend to like it at a party, but it lacks the big, ripe fruit characteristic of say, a Napa Cabernet Sauvignon. The 2012’s were a much different animal, and produced a wine that everyone would drink happily. For the most part, the 2012 wines are rich, rounded and juicy as can be. I already know a few purists who are scoffing at the wines for their uber-enticing style and seemingly early drinkability. Oh yes, I forgot to tell you, wine geeks often like wines that are crisp, high in acid, great with food and have potential to age over decade’s time. I am okay with both, I would just have to change my food pairing choices. Pinot Noir is always a challenge. The wine is one of fussiest on the planet. The wine folks in the Willamette Valley are used to being on the outskirts of life and have come to love all their vintages for what they are. One fact is undeniable – unlike Cabernet Sauvignon, Syrah and Zinfandel, it cannot hide. Vintners cannot use oak, sugar or other varietals to make it better. It is what makes us love it or hate it. Here are a pair of favorites from my notebook. The classic and red-fruited 2013 Domaine Drouhin Pinot Noir from Dundee Hills, the fine and complex 2012 WillaKenzie Aliette and the cool vintage 2011 WillaKenzie Pierre Leon. 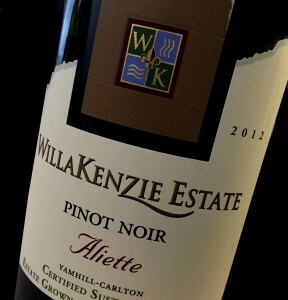 Give them a try and you too will discover how nifty the Willamette Valley vintners are!